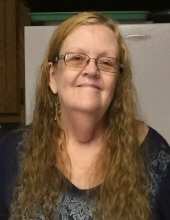 Janice Kay Pledger Stotz Hall, age 66, long time resident of Tonkawa, passed away Wednesday, March 27, 2019, in Oklahoma City. A funeral ceremony to gratefully celebrate Janice's life will be held at 11:00 am, Monday, April 1, 2019, at the First Baptist Church in Tonkawa with Pastor Terry Ballard officiating. Following the ceremony, she will be laid to rest privately at the IOOF Cemetery in Tonkawa, OK. Arrangements are under the direction of Trout Funeral Home & Cremation Service of Tonkawa. Janice was born on May 16, 1952 to Lloyd Pledger and Evelyn Curby Pledger. Janice was raised in Tonkawa, and graduated as a Buccaneer. Her life was filled with serving and giving to others. As a ardent supporter of her church and faith, Janice gave much of herself at the church. Janice devoted most of her time working along side other beloved women involved in the Women's Missionary Union. One particular project close to her heart was making dresses that missionaries took to children in Uganda. Janice sewed over 365 dresses in one year. At other times, Janice served at the Tonkawa Food Bank and was also a kitchen vounteer for church fellowship and funeral dinners. Janice enjoyed painting, sewing and crocheting to create items for others. Along the way, Janice earned a number of blue ribbons for each one of her hobbies each year at the county fair. She was known as someone to count on if you needed answers to old movie trivia. She will be dearly missed by her family, her church, and all of the others who were also blessed by her caring nature. Survivors include her daughter Kimberly Griffith of Plano, TX, son William Curby Deem of Oskaloosa, IA, and granddaughter Jalyn Curby Griffith of Plano, TX. Janice was preceded in death by her parents and husband Timothy Stotz. In lieu of flowers, memorial contributions may be made to the First Baptist Church of Tonkawa to be used for the Women's Missionary Union, 212 N. Main St., Tonkawa, OK 74653. To send flowers or a remembrance gift to the family of Janice Hall, please visit our Tribute Store. "Email Address" would like to share the life celebration of Janice Hall. Click on the "link" to go to share a favorite memory or leave a condolence message for the family.